Hello! The Inspiration Challenge was so fun that I had to go back for seconds!! 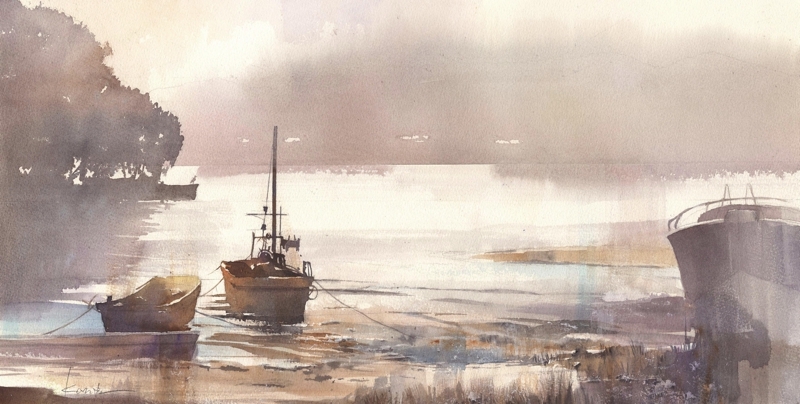 I was inspired by this fishing boat painting. For my card, I used 'The Waves on the Sea' set and the 'Fishing Net Background' from Our Daily Bread designs. I started out making the card as a monochromatic, as the painting, but it was too plain, so I changed the color on the banner and added some sponged color to the image panel (which was cut out with the ODBD Custom 'Elegant Ovals' Dies). The card base was embossed only with the ODBD Custom 'Faithful Fish Pattern Die and Debossing Plate', which, used as a cutting die, will cut out the tiny circles. I love using this die plate to emboss card bases since it does not warp the cardstock as some embossing folders do...yay!! I added only linen thread for an embellishment since I was aiming for a flat card which only took one stamp....mission successful!!! :) Thanks so much for looking! Have a very blessed day! Beautiful Angie!! I LOVE that stamp! Love it with the banner sentiment and the fish pattern bg is perfect! WOnderful........such a warm but masculine card, Angie! This is beautiful - and I love that Bible verse!! It goes perfectly with your beautiful image!! What a handsome striking card with the perfect sentiment to go with it! This is wonderful, Angie! I love your layout and the embossing w/ the matching image on the flag is terrific.